Get a single point of contact with excellent project management and communication skills. A dedicated team to perform daily reviews to ensure quality standards in codebase and all deliverables. We create polished mock-ups (UI and UX) and Architecture design. Our milestone based billing methodology always keep things crystal clear for all our customers. We also support Fixed Price, Hourly & Monthly billing models. A Process that answers the need for proper change management. Just push your requirements and get it done from Start to Finish no matter how new your idea is.. Mutually agreed SLAs for every business engagement. What, When, Where... everything planned and fully documented. We are different from the crowd, we really are! 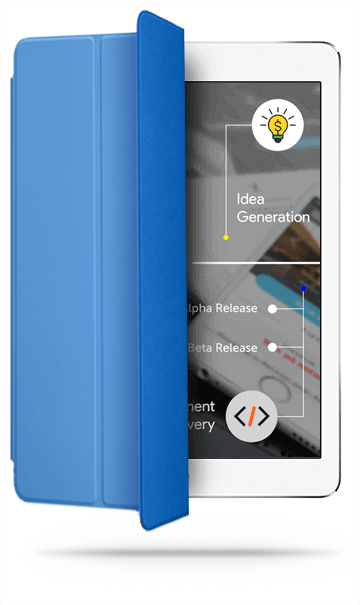 Our leadership team is doing great with technology not from years but since almost two decades across the world, and leveraging that BIG experience in cool mobile projects ensures that nothing would go wrong with your work. We ain’t a robotic software factory, but a team of seasoned consultants giving great time and expertise to each project we do, resulting in a great experience for you and a great App for your customers. We have the best professional ethics; we are always transparent, straight but extremely helpful. We consider relationships with our customers as the best earning, and try our best to uphold the expectations of a partnership like relationship. We are clear that you’d choose us not only for cost but for quality and longer term comfortable association, and therefore we work towards that. You ring us even years after the last project we did, you’d find us equally warm, and ready to help. COLLABORATION. ACCOUNTABILITY. PROFESSIONALISM. ENTREPRENEURSHIP ! It is no secret that the most successful companies are the ones that constantly refresh and energize their growth strategies to capitalize on new market opportunities and remain competitive –both during challenging economic times, as well as in periods of robust growth. In addition to organic growth, leading companies also employ inorganic approaches to build and refine their portfolios, including mergers and acquisitions , divestitures, and carve-outs. While IT is technically feasible to implement technology projects within a few short weeks, it is often the people side of technology that determines whether or not a project succeeds or fails. Visible sponsorship, effective project planning, experienced IT professionals and aligned stakeholders all contribute to a successful IT transformation.We deliver results with better people, process and technology. Smart Folks has always prioritized quality over quantity, and our this ideology has made a leader of Web Development ,Product Development and Professional Staffing industry. Our responsiveness, high-quality work, dedicated team of engineers and best prices is what separates us from the rest. And the rest they say, is history! Bring all your ideas together and make faster and better operations than ever! At LiveMindz,we combine our expertise in business,technology and operations strategy! We have an ability to adapt different conditions and different situations!